Bask in the beauty of the legendary Victoria Falls and search for wildlife in two national parks for over 7 days of pure enjoyment as you explore the nature and beauty of Southern Africa! Your experienced guide will make sure you have a comfortable and enriching trip, so come and join now! You will stay in various accommodations which will include one night in a hotel, four nights in camping, and one night in a lodge. You will only camp in places where the location, scenery, and setting will ensure you get up-close and personal with nature. Tonight, the adventure begins but feel free to explore your surroundings before your welcome meeting. Your time in the small town of Victoria Falls can be filled with a variety of activities. Take a helicopter or microlight flight over the Victoria Falls for an additional price and let your breath be stolen away by the sight of the largest sheet of falling water in the world, cascading across two countries into a narrow gorge. Make sure to visit this UNESCO World Heritage Site, which is also one of the Seven Natural Wonders of the World. When you stand in front of the Victoria Falls, you will understand why the indigenous Tonga tribe, gave it the beautiful and descriptive name of Mosi-Oa-Tunya (The Smoke That Thunders). Please be back in time to meet your group at 18:00. After introductions, your tour leader will review the details of your trip. Your tour leader will recommend a good selection of restaurants from which you can choose to experience the cuisine on offer in Victoria Falls. You can also book an extra day or two pre-tour to make the most of your stay. After breakfast, you will continue to Gwango situated just outside Hwange National Park, named after a local chief. This park is the largest park in Zimbabwe occupying roughly 14,650 square kilometers. Look forward to an included afternoon open vehicle game drive on the estate. After dinner, you can go on an optional night game drive in the estate which will give you the opportunity to discover nocturnal animals such as porcupines, civet cats, genet, and leopard. You will head south towards Matobo National Park, which is at the Matobo or Matopos Hills, a scenic area of granite kopjes and wooded valleys. You will stay overnight at Big Cave Camp, in preparation for a full day of activities on the fourth day. Enjoy a day filled with the best that Matobo National Park offers, a guided rhino walk, and game drive brings you as close as possible with these ancient looking giants. Visitors to Matobo National Park regularly spot white and black rhino, sable antelope, and impala, among other wildlife. Return to Big Cave Camp after your exciting day and enjoy a sundowner while watching another spectacular African sunset. You will cross the Zimbabwe / South Africa Border and stay overnight at the Bolayi Game Lodge. The lodge is set in the Limpopo Valley, in the heart of the world`s largest concentration of Baobab trees, surrounded by fascinating granite outcrops in pristine bushveld vegetation. Your last night is spent in Johannesburg, South Africa’s largest city, also known as Egoli, or The City of Gold, referring to the gold mining history of this fast-paced city. Book a day or two post tour to explore the city. Visit Gold Reef City, the amusement park and museum built on an old mine shaft. This will give you the opportunity for a ride on the Shaft of Terror, a vertical-drop roller coaster that is known as the tallest and fastest roller coaster in Africa due to its sheer 47-meter drop. For the historically inclined, there is the ever-popular Soweto tour or just jump on a hop-on-hop-off bus to discover Johannesburg at your own pace. Tonight, you can dine in one of the many excellent restaurants the city offers. This will be the last goodbye after a healthy breakfast. This is the end of another incredible tour. This safari will take place in Zimbabwe and South Africa, which will cover a distance of around 2,350 kilometers. You will explore Victoria Falls, Gwango Estate, and Matobo National Park. 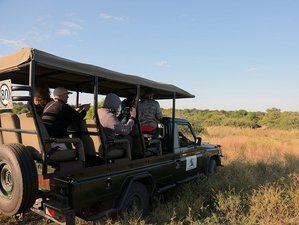 During this safari tour, you will be provided with six breakfasts, five lunch, and four dinners. Most meals will be prepared by your adventure crew but you will also be provided with a few opportunities for eating at local restaurants on a camping tour. Please book your flight to arrive at Victoria Falls International Airport (VFA). Transfer from this airport is included. Walk out of the international arrivals area and look for a transfer person holding an Africa4us sign and your name. Ask him / her what hotel he / she will take you to (do not volunteer this information). Then present your passport for proof of identity. Africa4Us needs to receive your arrival flight details not later than four weeks prior to the start date of your tour. Airport: Victoria Falls Airport Airport transfer included: Victoria Falls Airport No additional charges. You can request this in the next step. A reservation requires a deposit of 36% of the total price. Africa4Us is a travel company with premium products and services offering small group adventure tours and safaris throughout Southern and Eastern Africa.